Bart Simpson is my alter ego! Today's look is based around my favorite fictional character, Bart Simpson from The Simpsons television show. He is the eldest child. He is always getting into trouble. Lucky for you, it's easy to achieve his look! Getting the Bart look is actually pretty simple. He has a basic but iconic style. You will need a burnt orange t-shirt, a pair of jean shorts, blue hightop sneakers, & of course a skateboard. This Santa Cruz Bart model cruiser skateboard is actually modeled after Bart Simpson's skateboard; that's why it looks almost identical. Cool, huh? For true fans! Bart's standard outfit is actually really cute when you translate it to real clothes. He has a relaxed vibe that many people may find appealing. It's easy. It's wearable. It's effortless. I love the combination of jean shorts with blue high tops. Perfect to rock during summer! It's simple to achieve Bart's day-to-day look, but I also included a few of my favorite Bart inspired clothes & accessories. Because why not?! You can't go wrong with a Bart Simpson hat or a Bart Simpson tye die shirt or Bart Simpson Funko plushie. Hehe, this is so cute and fun!!! Haha this is so awesome and relevant (for me right now). While in Spain I really realized how popular The Simpsons (specifically Bart) are. Love it. I used to be OBSESSED with Bart Simpson. I had a little comic book and everything. Such a cute idea!! i used to loooove bart way back when. WHYYY are the simpsons not on netflix! This is so super cute! I used to love the Powerpuff Girls, would love to see an outfit inspired by them! Awh, that's such a cute quirky outfit! Bart is my idol! I love the look. It's so cute and perfect. Sooooooo cute!!!! Bart is one of my faves!! Haha I love this, Bart is hilarious! I Love the things you picked out!!! This idea is so funny ;) great !!!! hahaha this is amazing! who knew that Bart could make such a fashion statement? Great post! I have a shirt with bart simpson and I love it! 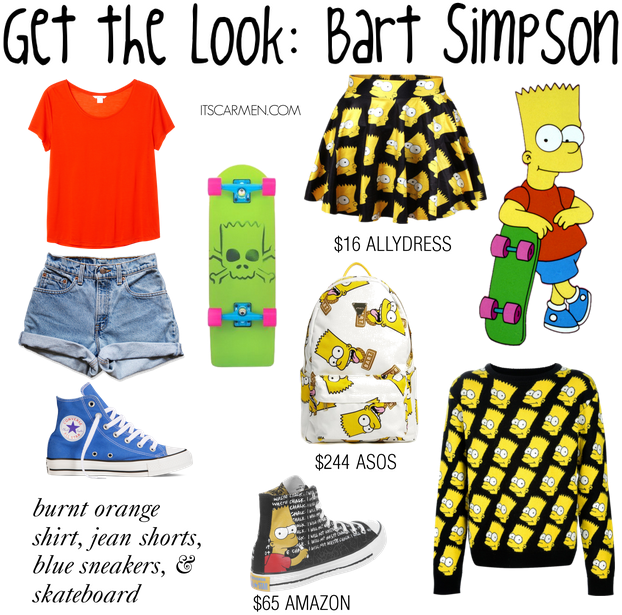 Oh wow this is so cool, I love the Bart Simpson converse and the skater skirt :)! Oh my, I love your collage of Bart's ensemble!!! Makes me want to own them all right now and skate down the street! Bart Rocks!! haha :D really a nice selection and a awesome post :) Love the simpsons! Oh my word, this is awesome! I love just the shirts, shorts and shoes combo. I think they still do the "every Simpsons ever" on one of the Networks. It's not uncommon to be playing in our house. Hahaha you're awesome. I love how you aren't afraid to have a little fun and joke around! I'm more of a Family Guy fan and every year I tell people I'm going to dress up like Meg for halloween and somehow I just never end up doing it... This year, for sure! This post is super cute. I love the Simpsons. This would be such a quirky outfit. I would love to wear these. HAHA that's cool! You know, Ebay does have some amazing things when it comes to buying sweaters of favorite cartoon characters! Wow that backpack is expensive?! but the skirt and shoes are super cute!